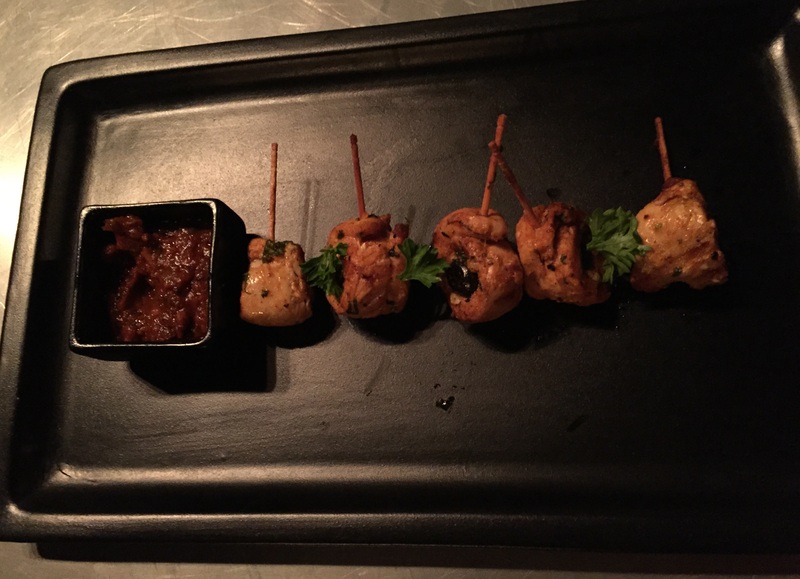 As I crossed the fashion zone of Pout Café, I entered Penthouse, a modern lounge & bar located at Greater Kailash-1. The restaurant has the look & feel of a classic English bar highlighted by the neutral palette & dark wood décor. I was quite pleased to see the stylish outlet with aesthetically pleasing interiors. The lounge had nice round and square tables with comfortable chairs. The seat we chose to sit on had an innovative table. 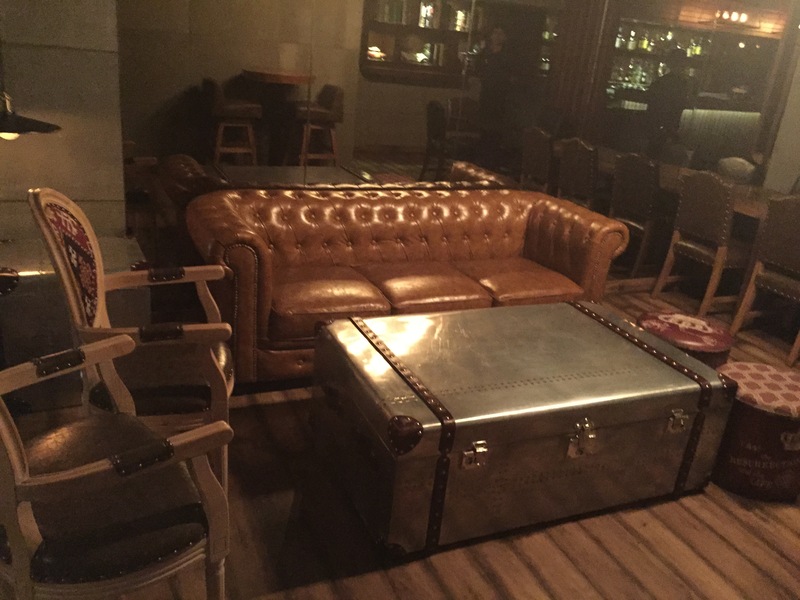 It had a trunk shaped table with a sofa. 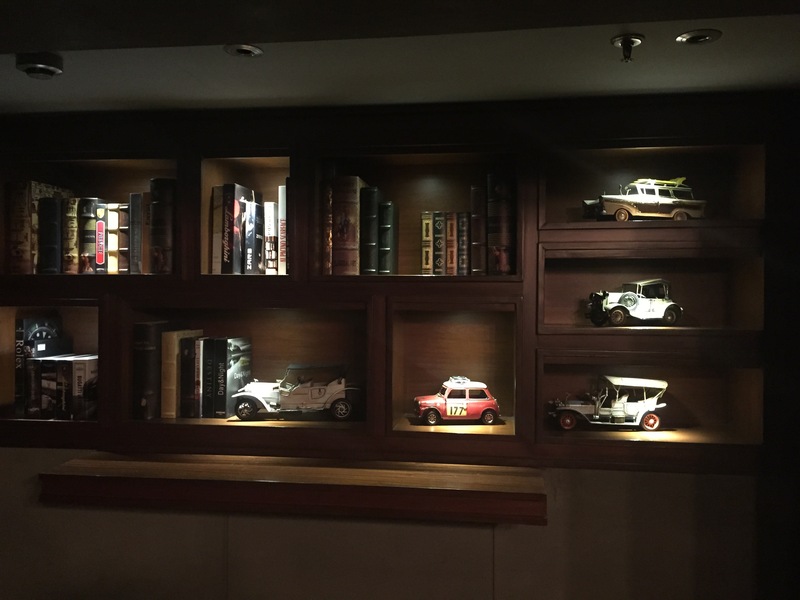 One thing that I absolutely loved and adored was a wooden cabinet with classic books and small models of vintage cars. Seems like Sunny Bhatia, the owner of the place is a car enthusiast. The cabinet boasted of titles like Bugatti, Porche, Rolex, Classical Art. It looked like favourite corner of a person who adores classical art and vintage cars. After appreciating the décor, it was time to order and my stomach was already grumbling. A quick glance on the menu revealed that the menu was smartly segregated across sections like ‘from the east’, ‘from the west’, ‘from home’ across ‘Starters’ & ‘Small Plates’. For drinks, I ordered Penthouse Julep, a blend of apple, orange, pineapple juice and fresh mint. As I took the first sip, I felt quite refreshed with the sweet flavor. 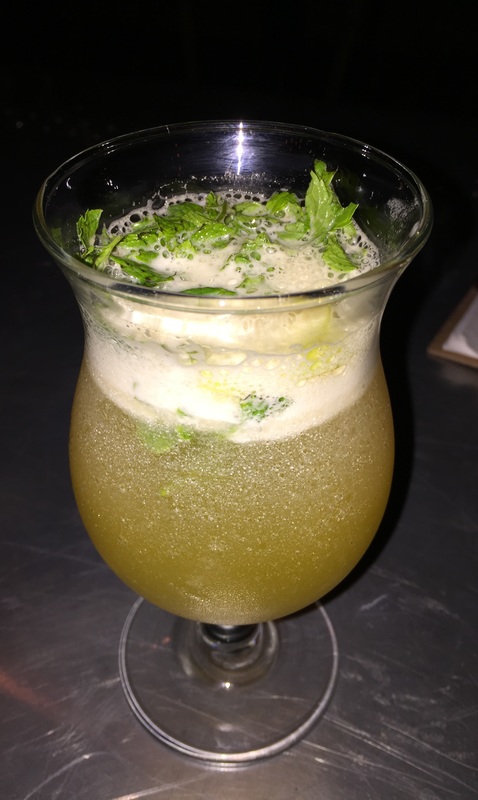 The mint leaves made the drink even more refreshing. For Starters, we ordered Grilled Olive Chicken (from the west), and Keema Gilafi (from home). The Grilled Olive Chicken had black olives stuffing with Cajun spices served with ranchero sauce. I could never think olives could be stuffed with chicken. Isn’t that something out of the box? Loved the idea…it was surely a nice combination. The ranchero sauce was made of onion, garlic, thymes and tomato and gelled well with the chicken starter. Our second starter Keema Gilafi was mutton mince mixed with spices and finished with gilaf (cover) of onion and capsicum. In my version, it was seekh kabab with sprinkled capsicum and bell pepper. The dish was served along with onions and mint chutney. The lamb was full of nice flavor, was fresh and tasted well. The next dish which was coming on my palette was Thin Crust Exotic Vegetable Pizza’. 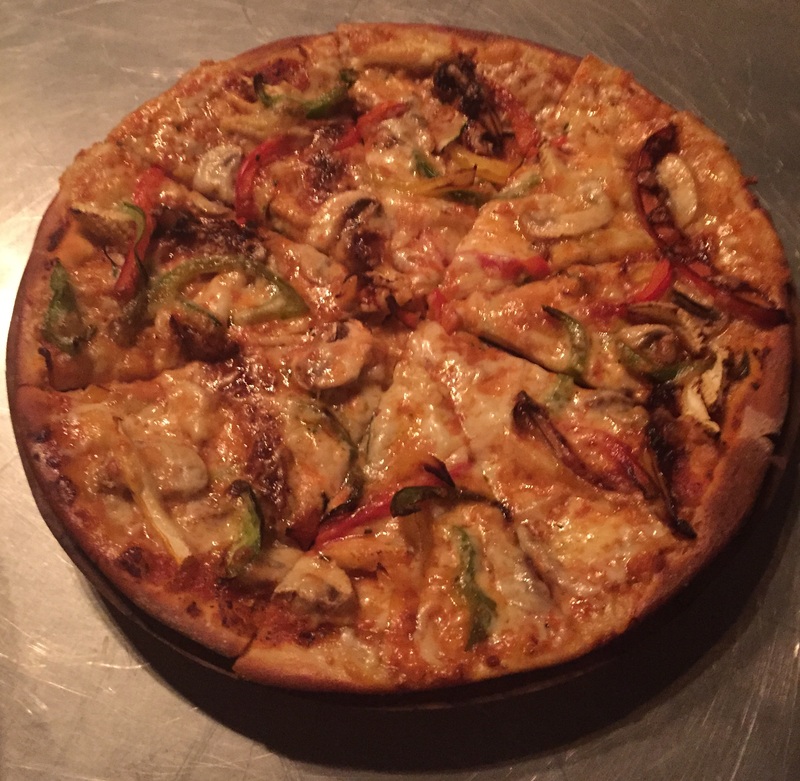 The thin crust was crisp and the topping was full of nice veggies like mushrooms, baby corn, zucchini & bell pepper which didn’t only add the required taste but also made it attractive to the eyes. 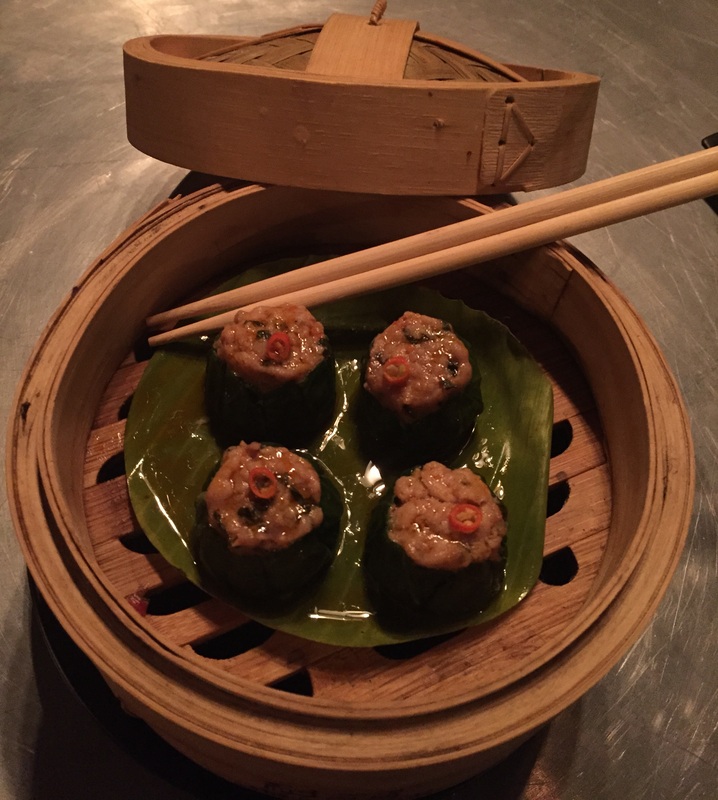 From the interesting variety of dimsums on offer, I chose Chicken with fresh red chilli & scallions. I was curious to know what scallions are and when I got to know, I was pleasantly surprised. They are nothing but spring onions. The dimsums were tender, nice and well cooked. Though when I bit them, oil dropped from the dimsums and ruined my denim which wasn’t a great feeling. The dimsums were blanched pokchoi with chicken filling topped with red chilli, peppers and spring onions oops scallions ;). Now it was time to order from the Small Plates section and I ordered Chicken Steak (from the west), Thai Basil Chicken (from the east) and Mumbaiya Keema Pav (from home). 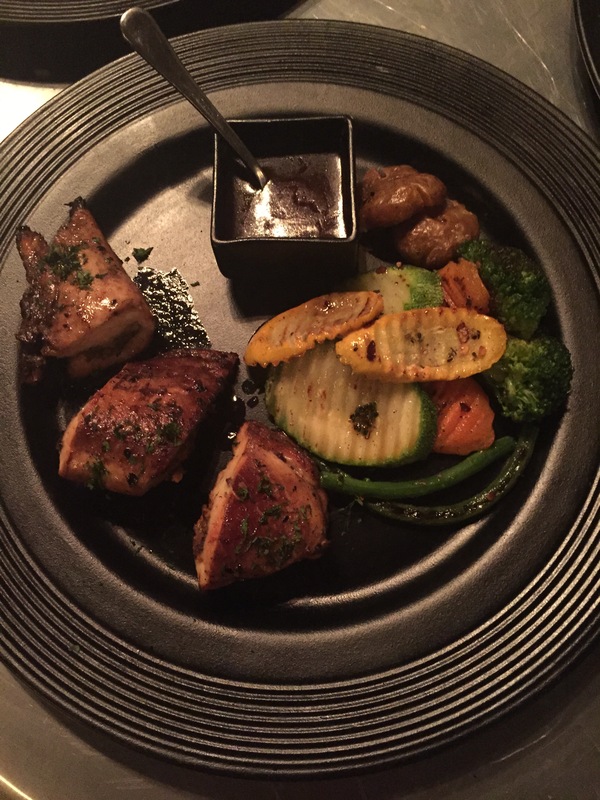 The Chicken Steak was stuffed charcoal grilled chicken with diane sauce & vegetables. It was one of the healthiest options and reminded me of my diet days. The chicken was stuffed with finely chopped mushrooms & carrots making it flavourful and nice. It was served with sliced zucchini, broccoli, carrots, beans and potato. I just loved the way the veggies were cut. They had a nice design making it attractive and pleasing to the eye. The diane sauce which accompanied the chicken steak was a mushroom based sauce and tasted well. I can surely survive on the chicken steak for months if I plan to start my dieting again to shed those extra kilos!! 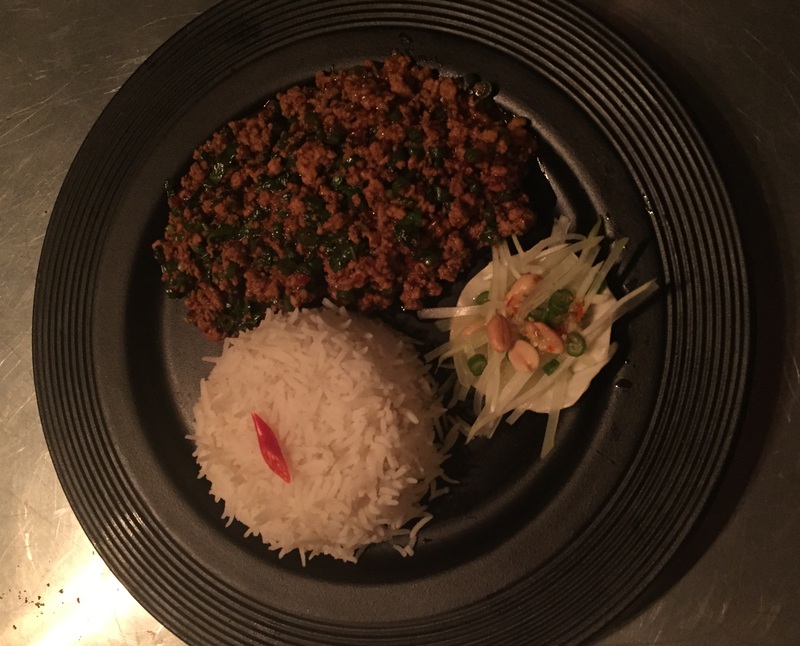 The Thai Basil Chicken was minced chicken stir fried with basil leaves and served with jasmine rice. Basil surely gave a nice aroma and taste, rice was rich in flavor and chicken was juicy. It was surely a win-win combination. The dish was served along with a salad made of chopped papaya, peanuts & beans in a cauliflower base. 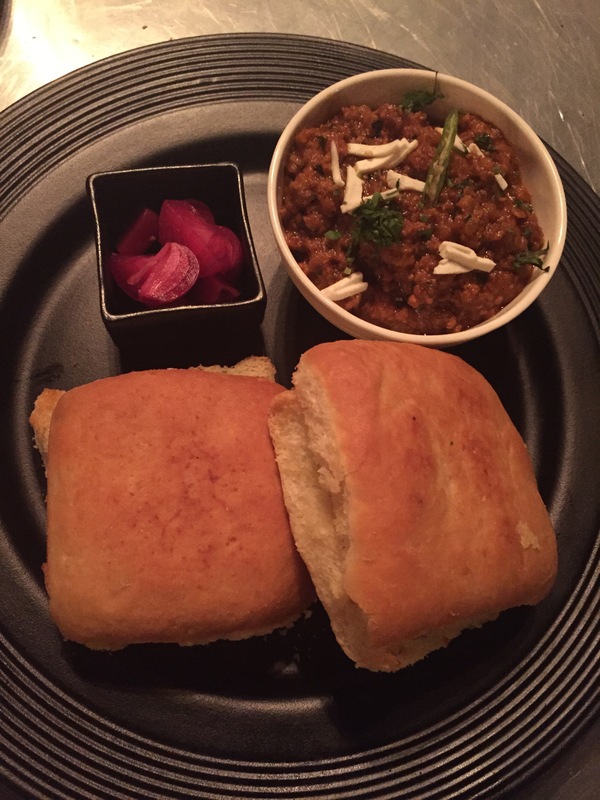 Now comes the last dish of the evening- Mumbaiya Keema Pav. It was minced lamb cooked with traditional spices and served with pav. 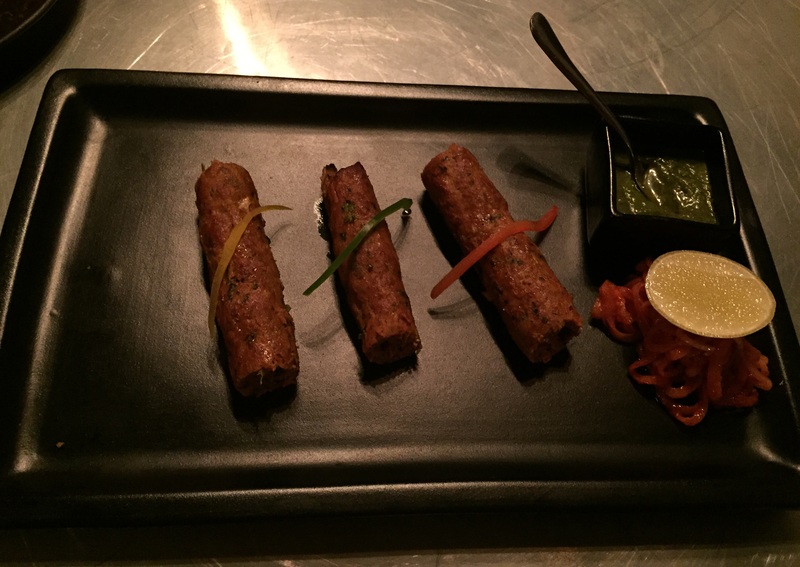 The keema mutton was delicious, and cooked to perfection. The pav was fresh and soft. The keema was topped with sliced cheese which made it more mouth watering and also gave a rich taste. I haven’t even had such tasty keema pav in Mumbai. I am glad I will not miss Mumbai that much now. 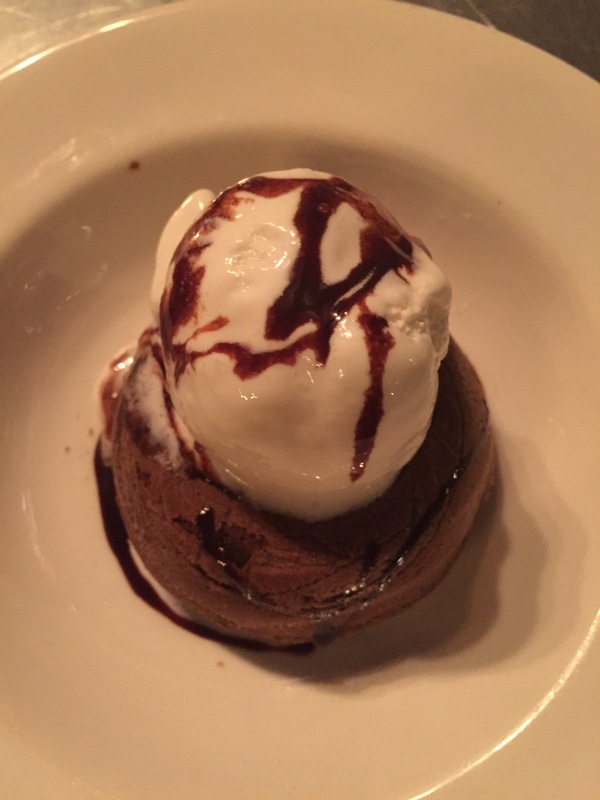 For desserts, I had Molten Chocolate– An all time favourite recipe, chocolate sponge cake topped with hot chocolate sauce and vanilla ice cream. I started with the bottom most layer-the chocolate cake which was to die for. The vanilla ice cream with the cake was a double whammy. A never go wrong formula for sure! The vanilla ice cream even had liquid chocolate on it making the desert absolutely yum. Overall, it was a great experience. The staff was enthusiastic and served us well. I do recommend this place if you would like to have a great meal. Loving the vintage car collection at this place, the food looks yummy too. Thanks for sharing your experience girl.